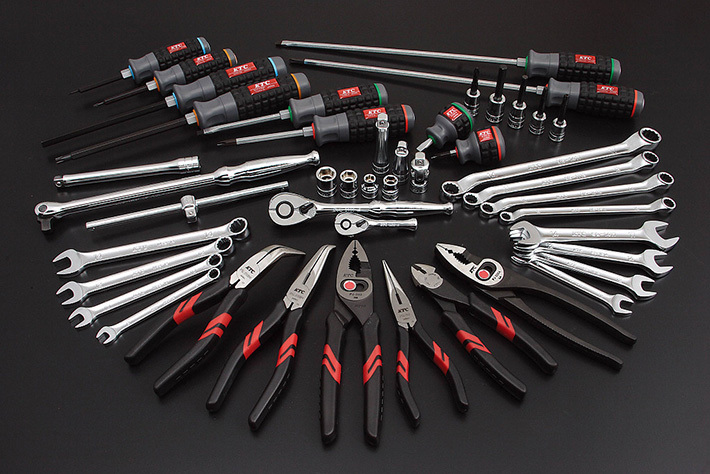 As a hand tool manufacturer representing Japan, KTC with its high-quality performance and unique technology leads the market under the concept of manufacturing light, durable, and comfortable products. KTC has developed a wide range of more than 10,000 products, representing the highest number of products and overall production quantity in Japan. Our track record has won us the trust of our customers. At the time of founding, a logo of the character “Kyo” from “Kyoto” enclosed in a double circle was engraved in the center of the Roman letters “KYOTOKTC” carved in relief on the onboard vehicle tools for Toyota. Also, for the tools on the market the “KYO” character was enclosed by a stylized version of the character “KO” (works).Used as the onboard vehicle tools for Toyota.Certified by the Ministry of Trade and Industry as Grade A excellent vehicle parts.A designated brand of the Defense Agency. From this period onwards, the logo on the product was gradually changed to a simple “KTC” mark. 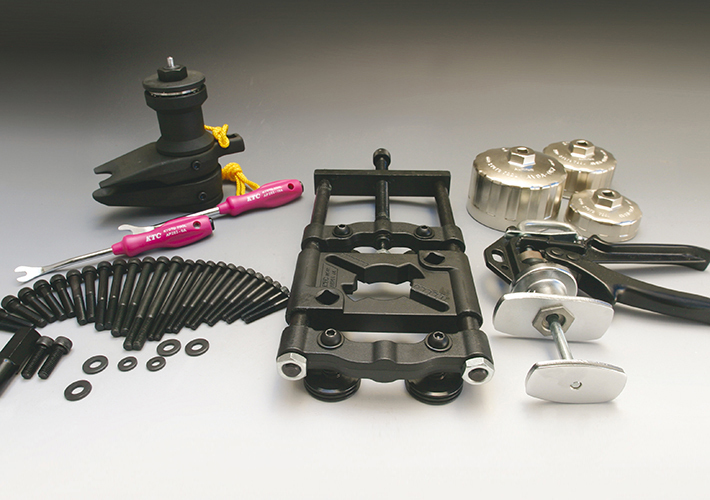 KTC rode a wave of motorization that included an increase in the supply of onboard vehicle tools to Toyota Motor Corporation, and exports to the United States through the Fuller Tool Co. In only 16 years from its foundation, KTC had reached the top of the industry. 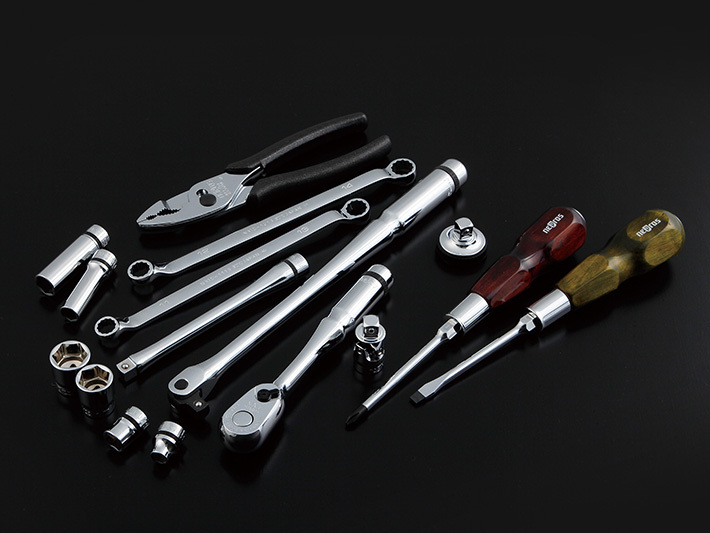 A tool set specialized for brakes was developed for use in dismantling, assembling and adjusting brakes of all manufacturers. 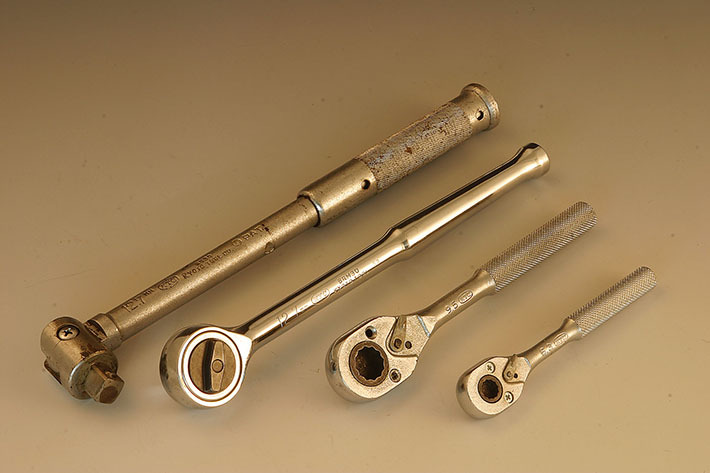 From here new concepts of specialized tools began that made complex operations “simple” and “quick” across all types of machines, leading to the development of such tools as the “Multipuller” and the “Crank shaft pulley tool series”. 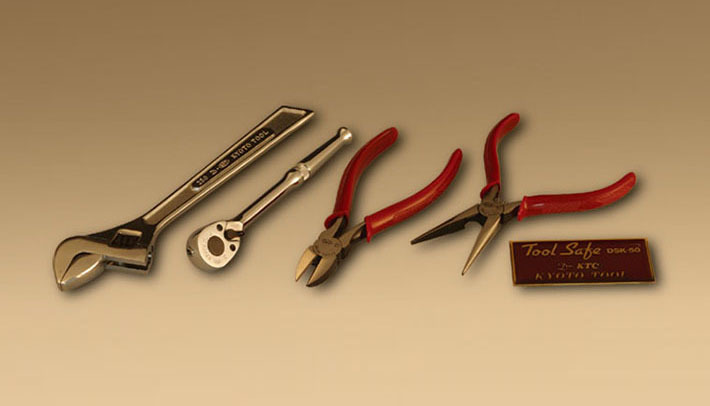 In 1982 KTC’s “Deluxe Tools”, a monument to KTC’s dedication to the making of high-grade tools, went on sale. The 3,000 limited edition sets, all hand ground, and stamped with the mark “D”, were all sold in an instant. Then in the same year, the “Mirror Tools” was developed to commemorate KTC’s 35th founding anniversary under the concept of “KTC Leaps Forward into the World”. As tools that satisfied the pride of a professional mechanic, the outward appearance, which, as the name suggests, was highly polished like a mirror, attracted a great deal of public attention. The Factory Furniture (FF) WORLD was developed in 1992 and was born from a concept of achieving work efficiency and rationalization, while increasing the comfort of the workers in the factory. In 1995 the Mirror NEPROS was launched - an ultimate tool that stimulates the senses of the professional mechanics, was developed under the concept of “stronger, easier to use, and more beautiful”. KTC established its own independent standards, and new technologies were introduced for every process from material development through to surface processing. The original form pursued an ideal and made no allowance for others to imitate. A complete renewal of the standard tool based on 50 years history and technology built up since the foundation of the company. The concept is “the tool for the new century that will still be in use in 100 years”. Having inherited the DNA of our highest-level brand “NEPROS”, this will be the top of the standard with the functionality of the NEPROS expanded to the maximum limit. It will achieve progress on all frontsincluding form, function and price. 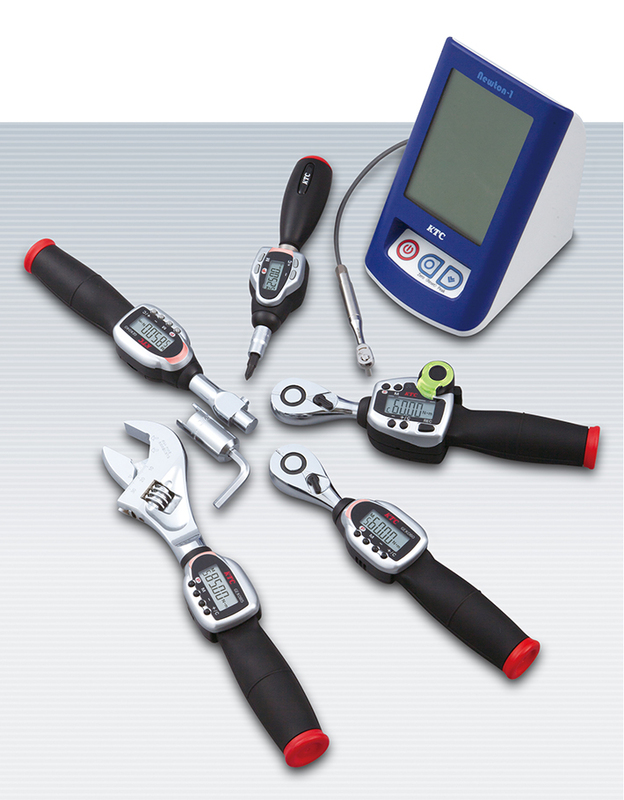 One of KTC’s most rapidly evolving tools is the digital ratchet torque wrench. Ideal for use in automotive maintenance facilities and other workshop settings, the digital ratchet torque wrench allows the user to easily control the amount of torque being applied to a fastener. 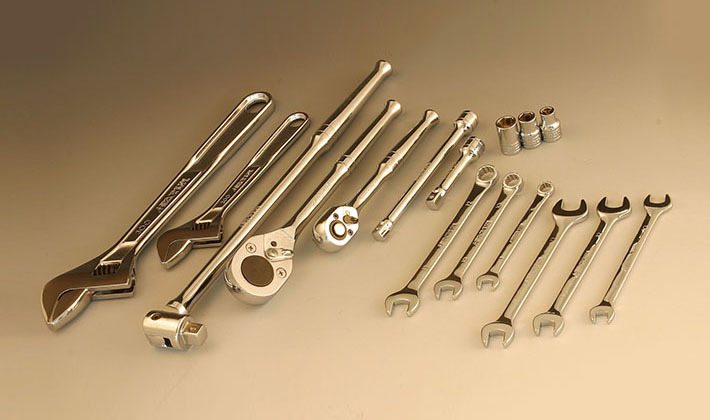 This ensures that each fastener is tightened to the proper value regardless of who is using the wrench, thus improving both the quality and safety of the work. Now, with the debut of KTC’s memory-equipped digital ratchet torque wrench “Memorque,” quality control and safety are enhanced even further.